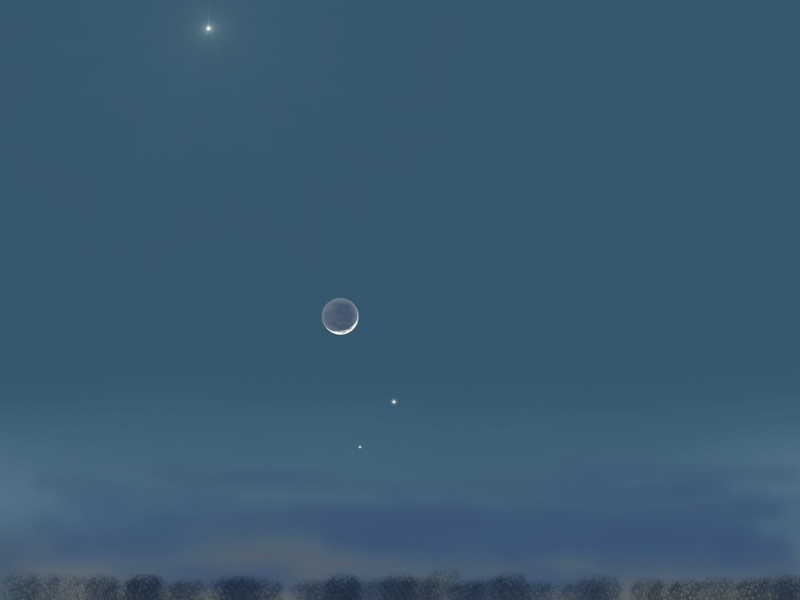 I was fortunate to have witnessed the grouping of the Moon, Mercury, and Jupiter again on December 29, 2008 (23:15 U.T.) with the addition of Venus. The Waxing Crescent Moon was now above the pair of Mercury and Jupiter. Mercury (-0.75m) was approximately 7.5 degrees above the western horizon, Jupiter (-1.51m) ~10 degrees, the Moon ~15 degrees, and Venus (-4.25m) ~33 degrees. Earthshine was easily visible over the unilluminated portion of the Moon. This grouping was very striking against a pastel blue sky with lavender clouds below over the western horizon. A digital image produced using Gimp. I wish, I was there to see this in real view. Thanks for nice picture. A beautiful sight in the sky or on the monitor. Great sketch. That is a very beautiful and artistic sketch.